Take a picture of your SLFCU card with your device's camera, or enter it manually. 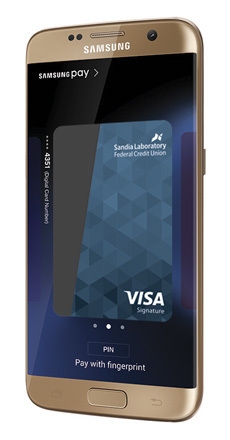 See www.samsung.com/pay for eligible devices and more information about how to use Samsung Pay. Available anywhere you can swipe or tap your Visa card on select Samsung devices. See Samsung site for complete list. Samsung and Samsung Pay are trademarks or registered trademarks of Samsung Electronics Co., Ltd.